Twenty years after the fall of the Berlin Wall, it is obvious that the neoliberal utopia of the “happy 90s” and the belief that liberal democracy has “no alternative” failed to achieve its goal. In the 21st century the neoliberal dream evaporated at least twice: first with the attacks of September 11 and then with the financial meltdown of 2008. This brings us back again to the “idea of communism” and the question of the alternative to the “living dead” of today’s capitalist societies. But why “socialism” and not “communism” in the title of our conference? Our idea is that we have to speak about socialism first if we want to reach communism. The conference will cover various topics ranging from “socialist” projects and new practices around the world (from Venezuela to the student protests in Croatia in 2009), to the crucial question, “how does our predicament today look from the perspective of the communist idea“. In that sense, the Subversive Film Festival will not a priori glorify “socialism” as such, but will give an opportunity to look at it from various even opposing perspectives. The international conference of the 3rd Subversive Film Festival, to be held in Zagreb between May 3-7, 2010, is an opportunity to continue the work of the Birkbeck conference “On the idea of communism” held in London in 2009. 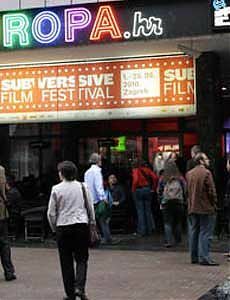 The 1st Subversive Film Festival in 2008 was dedicated to the anniversary of ’68, with guests such us Slavoj Žižek, Ernesto Laclau, Chantal Mouffe, Frank Furedi, Neil Leach, Karl-Heinz Dellwo, Gabriele Rollnik & Dušan Makavejev. The 2nd Subversive Film Festival in 2009 was dedicated to the anniversary of the Cultural Revolution with guests such as Slavoj Žižek, Minqi Li, Wang Hui and others. The 3rd edition of Subversive Film Festival will be the final act of this trilogy. And then we will move on, of course, towards “brighter future”. Slavoj Žižek (SLO), Gianni Vattimo (IT), Samir Amin (SN), Michael Lebowitz (VE), Michail Ryklin (RU), G. M. Tamás (HU), John Milbank (GB), and others. Noam Chomsky (US), Michael Hardt (US), and others. Boris Buden, Igor Štiks, Andrej Nikolaidis, Ugo Vlaisavljević, Gal Kirn, Renata Jambrešić-Kirin, Marko Pogačar, Ozren Pupovac, Tatjana Jukić, Dean Duda, Milan Rakovac, Mate Kapović, Koraljka VLAJO, Reana Senjković, Stipe Ćurković, Rada Borić, Andrea Zlatar, Srećko Horvat, Sandra Prlenda, Biljana Žikić, and others. Two NeMe members were invited as observers and as participants to closed round table discussions.